The Xperia P uses the traditional droid Gallery, which hasn't really seen much change in Gingerbread. It has good functionality, cool 3D looks and nice transition effects, and shows full resolution images. Facebook and Picasa albums are distinguished by the small logo of the corresponding service. Facebook pictures can be "liked" with the thumbs up button in the upper right corner. There is no dedicated video player app on the Xperia P as in most of the droids out there. DivX, XviD and MKV videos are supported but the Xperia P has a rather selective filtering and not all videos got through. The Xperia P managed to play every MP4 file we threw at it, even the 1080p videos. Most of the high-res DivX/XviD/MKV files did run too. Unfortunately, the Xperia P has rather patchy audio codec support, most notably AC-3 is not on the list. So, some videos played without audio and some with unsupported bitrate didn't pass at all. There is no subtitle support and there is no way you can see video information (file name, codec, size, etc.). The Xperia P has the same music player that we liked on the Xperia S. You're welcomed to a Cover Flow-like interface and you can swipe left and right to skip tracks (complete with a smooth 3D effect). The More tab offers a Headphone surround option, which can be set to Studio, Club or Concert hall. If you're not using the headphones, you can turn the xLOUD feature on, which optimizes the sound for the Xperia P loudspeaker. 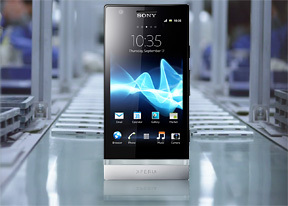 The Sony Xperia P is equipped with an FM radio, which has a really neat and simple interface. It automatically scans the area for the available stations and places "notches" on the frequency dial for easier scrolling to the next station. There's a Force mono option to use in case of poor reception. The Sony Xperia P performed identically to its Xperia S sibling in the active external amplifier part of our test. The smartphone got excellent scores all over the field and had above average loudness, which adds up to a great performance. What's even more impressive is that when headphones come into play the Xperia P is actually slightly better than its more expensive sibling. Granted, the results are so similar that it's almost certain that the audio chips inside the two are identical, but the P takes the narrow win here. 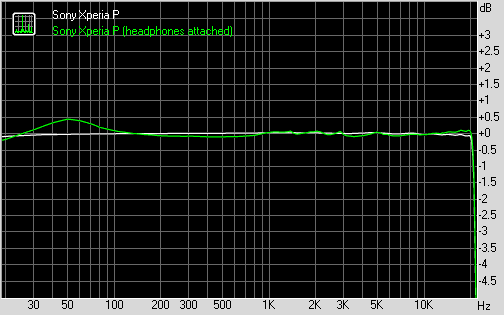 The stereo crosstalk rises by a somewhat smaller margin and a tad less distortion creeps in. Volume on the P, just as on S are about average.